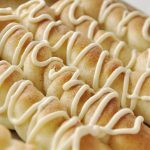 Learn how to make an easy breadstick recipe with a cinnamon sugar topping and cream cheese drizzle! You will love the doughy texture and this sweet dessert. This recipe was originally shared by LeighAnne from Your Homebased Mom. I have a hard time walking by one of those pretzel places at the mall. The smell alone is enough to stop me in my tracks. My favorite flavor is the pretzel with cinnamon sugar on it and the cream cheese frosting that comes on the side that you can dip your pretzel into – yum! I decided to recreate the taste at home but instead of a pretzel I went with a cinnamon sugar breadstick with cream cheese drizzle. I like the yeasty softness of a breadstick over a pretzel although I love me a good pretzel too. 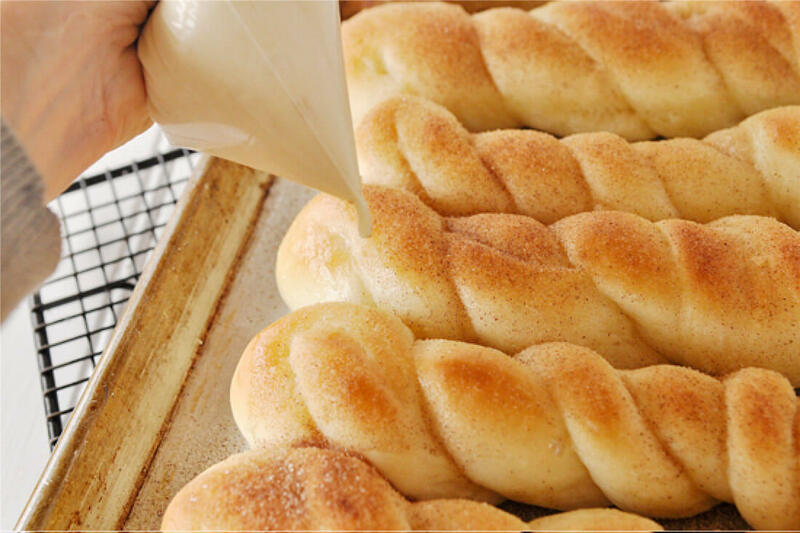 If you love this easy Cinnamon Sugar Breadstick recipe, you’re going to love these other cinnamon sugar recipes. Please click each link below to find the easy, printable recipe! You start out with a nice batch of dough. Remember the trick to working with yeast is to make sure your water is the right temperature – not too hot and not too cold – just right. About 105-110 degrees is perfect. It needs to raise about 30-40 minutes. I speed up the process a bit by preheating my oven to 150 degrees and then turning it off. I place my covered bowl of dough into the oven and it loves that nice warm environment. 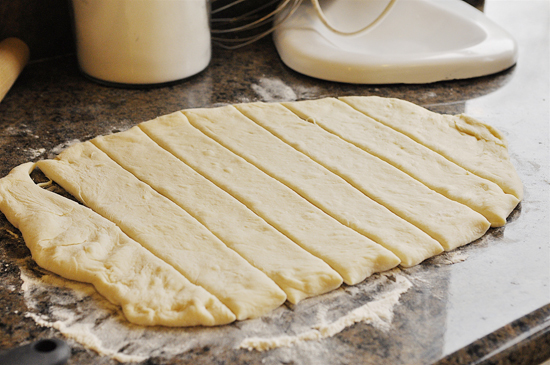 Roll the dough out into a 8 x 14 rectangle or there about. 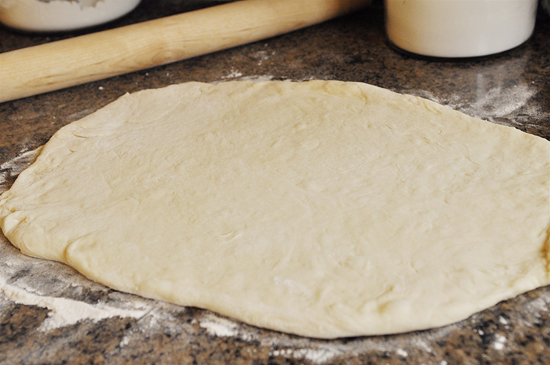 I use my pizza cutter to cut the dough into about 8-10 even pieces, about 1 1/4 – 1 1/2 inches side. Then roll them up like a snake. I then drap it over my finger in the middle, it will unroll but having done that helps to twist it together easier. 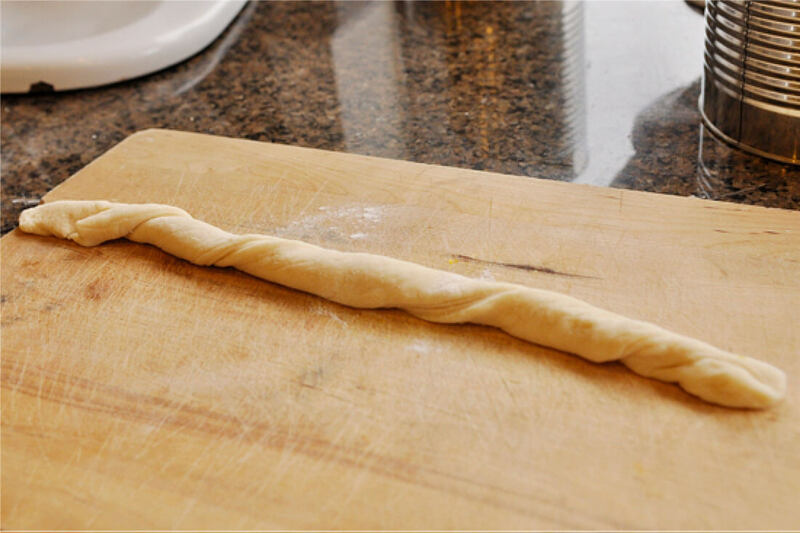 Twist the breadstick together in half. 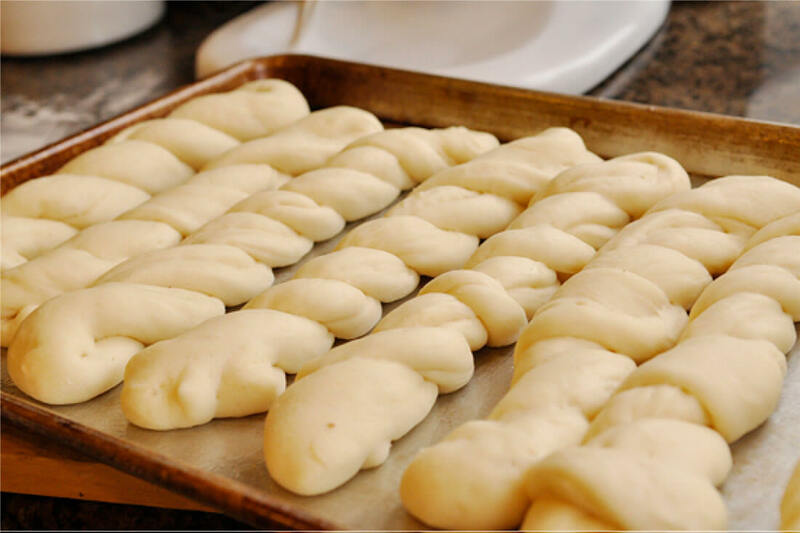 Place on a greased cookie sheet and allow them to rise for about another 40 minutes or until about double in size. 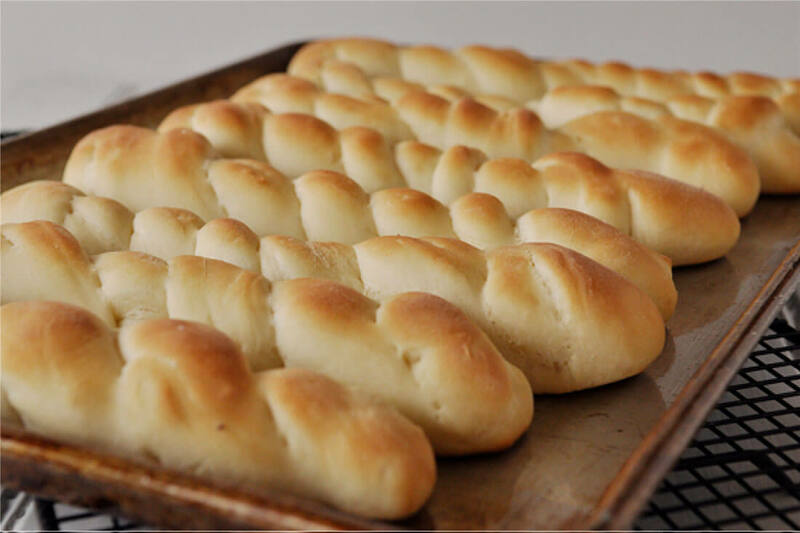 Bake them at 400 degrees for about 10 minutes or until golden brown. Brush them with some melted butter and give them a nice dusting of cinnamon sugar. Anyone who likes toast, knows that it’s always better with butter and cinnamon sugar. Yum! 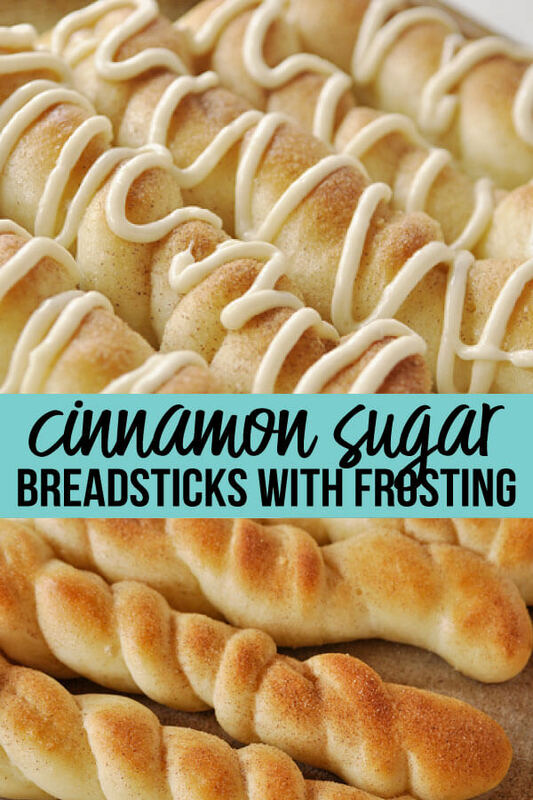 But adding this mix to buttered breadsticks with some cream cheese frosting will make your sweet tooth sing! Mix the sugar and cinnamon in a small bowl using a whisk or a small fork. If you want it to last, store the mix in an air tight container or mason jar. Mix up your cream cheese drizzle and put it into a ziploc bag and clip one of the corners off. 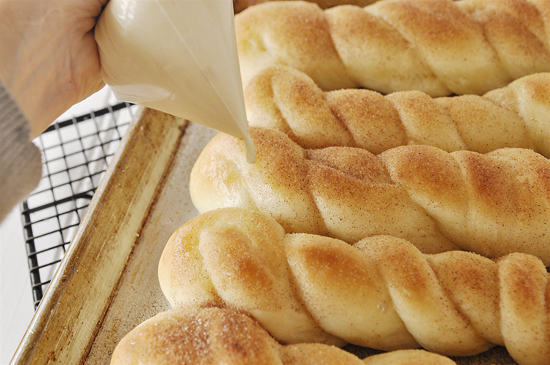 Drizzle the cream cheese down the breadstick. The more the better! 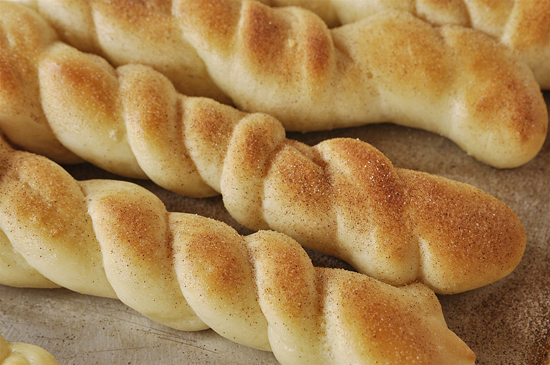 Since the breadsticks aren’t quite as sturdy as a pretzel, they are not as easy to dip and the drizzle worked better. If you love this Cinnamon Sugar Breadstick Recipe as much as I do, please write a five star review, and be sure to help me share on Facebook and Pinterest! 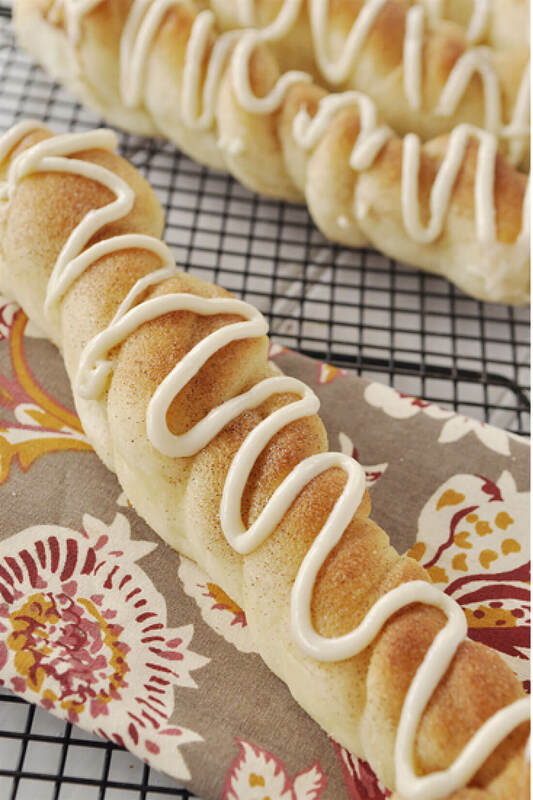 If you love those pretzel places at the mall, you will absolutely love these Cinnamon Sugar Breadsticks with Cream Cheese Drizzle! In mixer dissolve yeast, 1/2 tbsp sugar and 1/2 c warm water. Add in oil, egg salt, 1 1/2 c flour and remaining sugar and water. 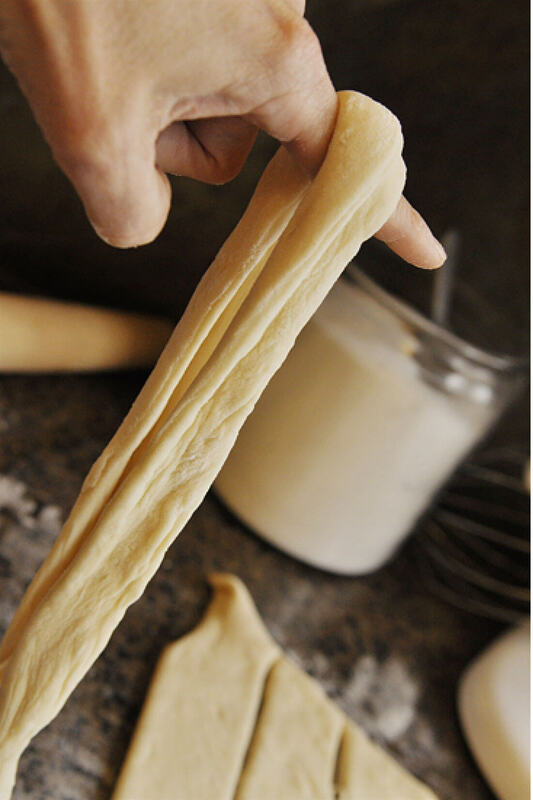 Stir in remaining flour to form a soft dough. Place into a greased bowl and cover. Let rise in a warm place for about 40 minutes or until doubled. 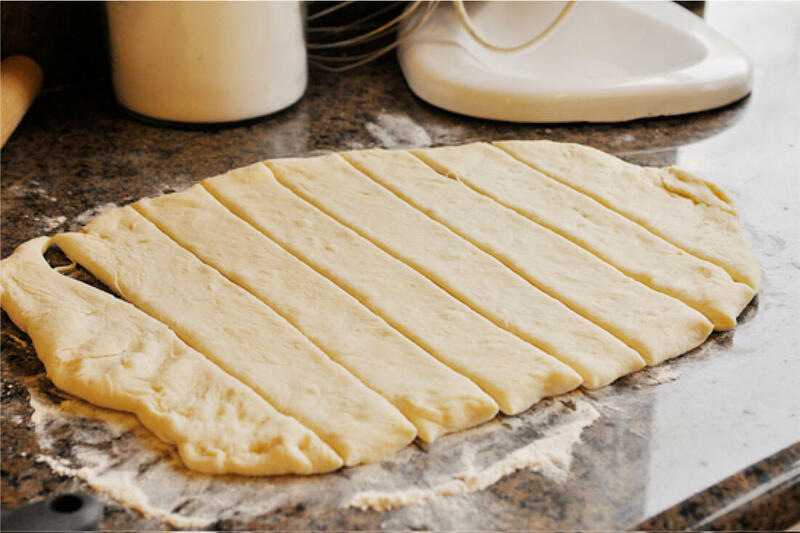 Punch down the dough and put onto floured counter. Roll into a 8 x 14 rectangle. Using your pizza cutter cut into about 10 pieces. Roll each strip like a snake. 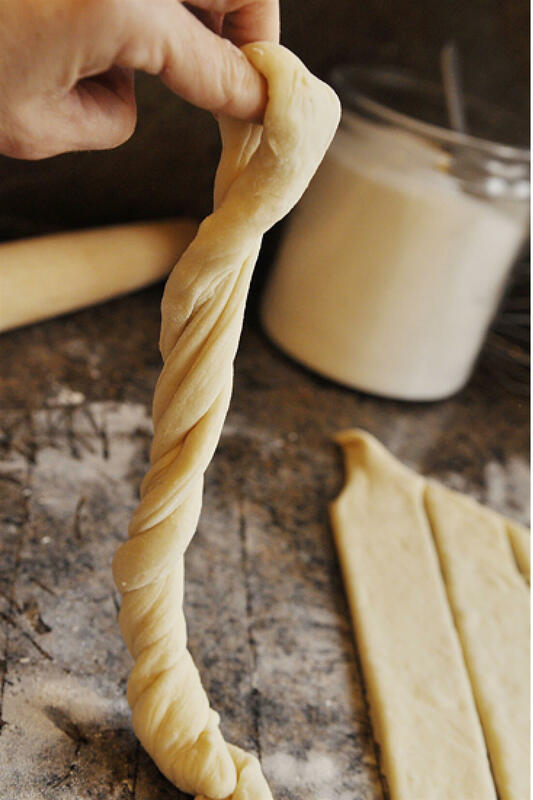 Then hang the dough over your finger in the middle and twist the two ends together. Place on a greased cookie sheet and allow to rise for another 20 minutes or until doubled. Preheat oven to 400 and bake for 10 minutes or until golden brown. 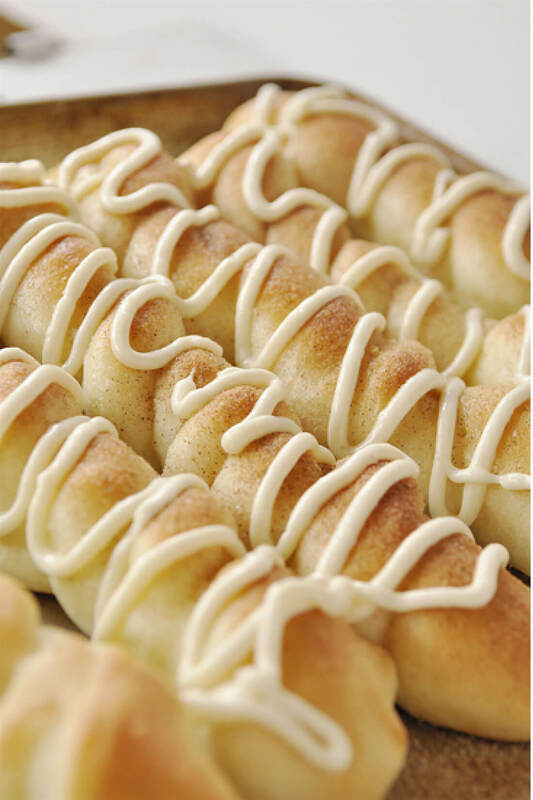 Drizzle with cream cheese glaze (see below). Soften cream cheese and mix everything together. Beat until a good consistency for drizzling. Place in a ziploc bag and snip off the corner. I was just wondering if you could use frozen bread sticks and then add the toppings. Do you have to start from scratch to create this masterpiece? So glad the recipe has become a favorite at your house! So glad you enjoyed them – wish I was sitting there with you enjoying one too!! 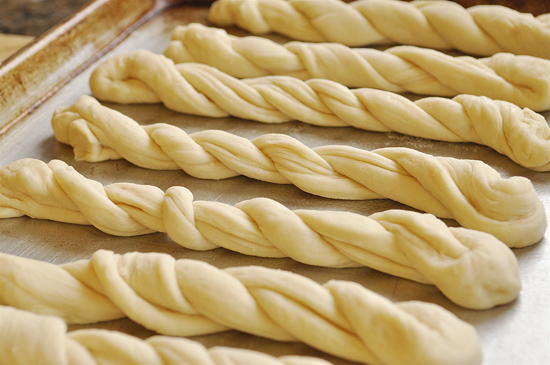 Love the idea of mixing wheat and white flour. I made these tonight. My kids loved them. The dough was definitely wet, but I added a little more flour, and they were perfectly soft and sweet in the end. I added toasted, chopped pecans after the drizzle and used an orange glaze on half of them instead of the usual cream cheese icing. They were a hit. Thanks for the great idea! I had the same issue with the flour and added more as it was really wet; the kids are all excited for these to be finished!! 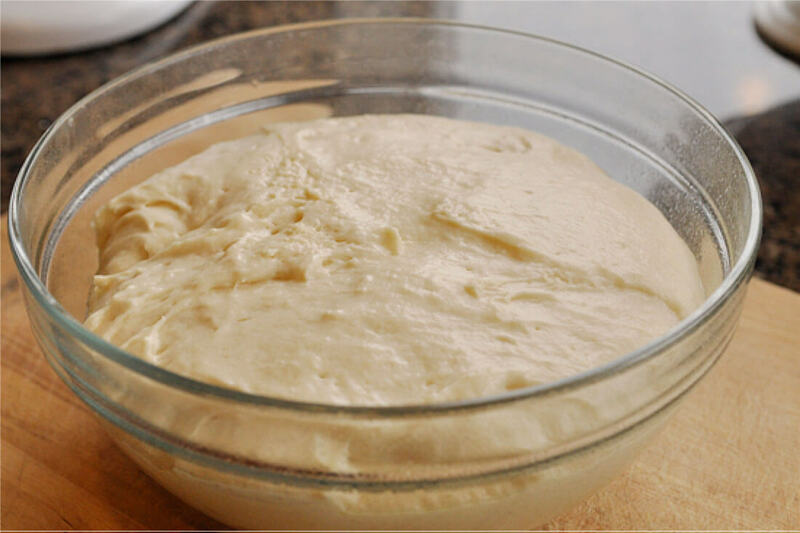 Alot of things will effect the stickiness of your dough such as altitude and humidity so depending on where you are and what the weather is you may need to add more flour. Just add what you need to get the dough soft and workable. Glad you enjoyed the recipe! By instant do you mean rapid rise? Leigh Anne, somebody really soon needs to develop a George Jetson app that allows us to just reach into the monitor for samples! It looks like about 1 1/2 hours start to finish on these babies, and I don’t think I can wait that long! Super yummy-looking! oh my goodness oh my goodness! I think I found a treat to make tonight! Do you mind if I feature it on my site!? You are welcome to feature it Cassie! Glad you like it.